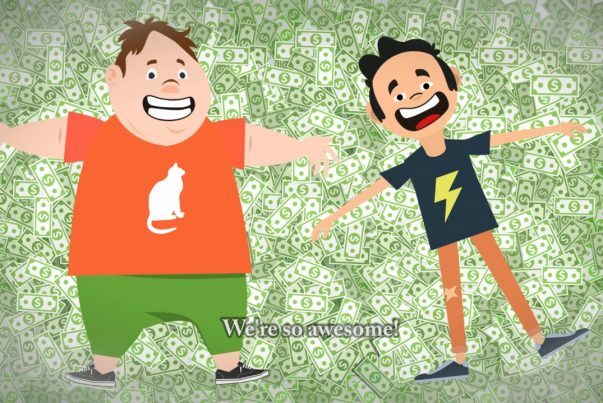 As part of a new series of hilarious animations being released on Counterthink.com, today I’m releasing “Sh*tcoin and Buttcoin,” a hilarious two-minute animation that satirizes all the brain dead arguments of Bitcoin cultists who have convinced themselves that Bitcoin isn’t a speculative bubble. You can watch it now at Counterthink.com (or see the embedded videos, below). As of today, Bitcoin has now plummeted 50% from its high, and many former Bitcoin cultists are finally starting to awaken to the reality that Bitcoin isn’t going to take over the world’s money supply. A major Bitcoin transaction hub, BitConnect, was just shuttered after being accused of sketchy, Ponzi-like schemes. At the same time, Bitcoin’s supposed usefulness as a payment system has utterly collapsed, and there’s even a report that a Bitcoin conference has stopped accepting Bitcoin as payment for the conference due to sky-high transaction costs and super slow “clearing” of such transactions, often exceeding two days. Bitcoin’s “market capitalization” is, of course, a mathematical hoax, as Bitcoin cultists are multiplying the last purchase price times the total number of Bitcoins in existence, even though the vast majority of them were purchased or mined for just a few pennies. There’s no “capitalization” of Bitcoin anyway, since Bitcoin isn’t a corporation and it owns no assets. It’s not even an entity. Yet people continue to be duped into thinking they are “investing” in Bitcoin as if they’re buying shares of a corporation or something. In fact, the entire Bitcoin Ponzi scheme has relied heavily on conflating cryptocurrency lingo with traditional stock market investment terms, tricking many people into thinking they’re buying into something that gives them ownership, dividends and the usual regulatory protections that criminalize Wall Street investment schemes. Imagine their shock when they find out that 1) Bitcoin owns nothing, 2) There are no regulatory protections against Bitcoin price fixing, insider trading and fraud, and 3) When you “buy” Bitcoin, you don’t own anything other than an entry on a shared public spreadsheet. Also, for the record: 4) Bitcoin is incredibly slow and expensive to use, costing over $20 per transaction and sometimes taking days to clear that transaction. 2018 will be the year that central banks begin to fight back against the growing phenomenon of cryptocurrency. Manipulating the crypto markets is child’s play for the central banks, which will no doubt engineer a panic selloff or cyber attack on the blockchain as a means to destroy the credibility of crypto in the minds of the public.